For our Chilean wine & dine event, my friend Frances made the following dish. This is a great vegetarian dish that's great on it's own or as a side to accompany your meal. Saute bacon in oil for 2 minutes. Add onions, bell pepper and carrot. Saute for 5 minutes. Season with salt and pepper. Add squash, saute for 5 minutes. Add remaining ingredients and simmer for 20 minutes. Serve. Since I don't care for bell pepper, I substituted red pepper flakes, and used a bit more bacon. 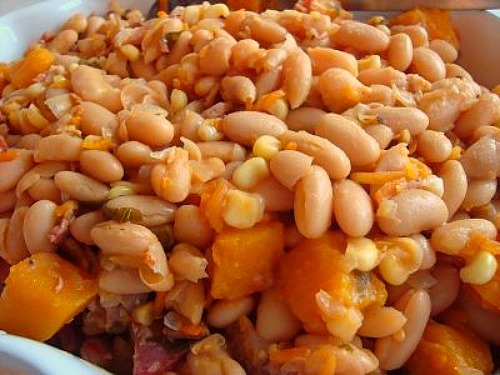 This is the recipe I used but in other recipes I'd seen for this, it called for cranberry beans, which aren't a common item in Dominicks or Jewel, so I usedcomparable, cannellini beans. I had a fabulous time at the event. I loved so many of the dishes. Oh...was there wine? Hehehehe, I don't really drink, so I'll have to take everyone else's word that the wine was nice as well.